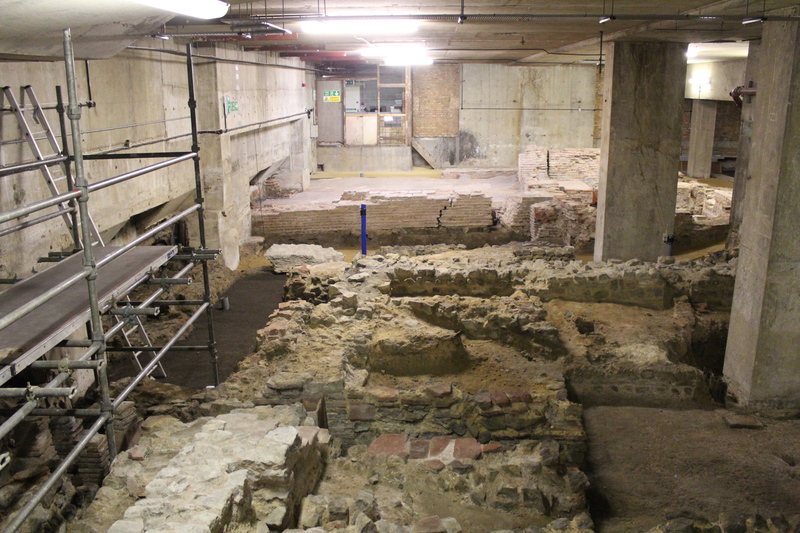 Tucked away in the basement of the most unprepossessing 1960s office block at 101 Lower Thames Street are the remains of a Roman house and baths dating from the 2nd-3rd century AD. 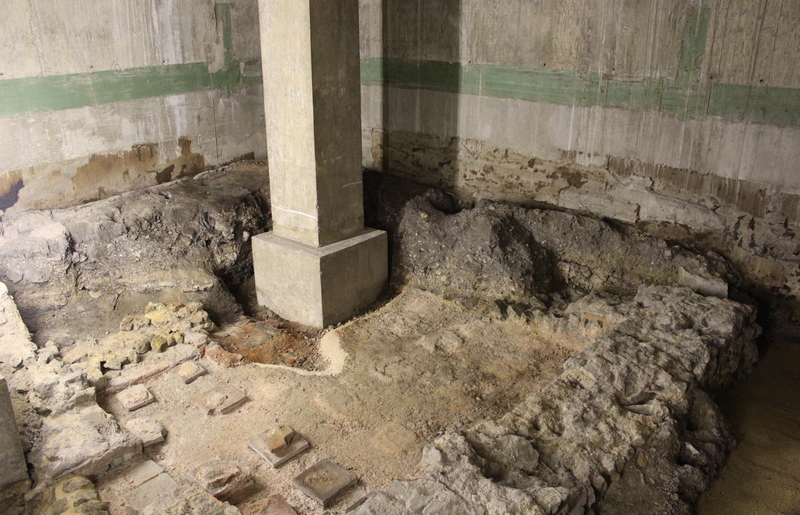 The Billingsgate Roman Bathhouse site is only open to the public a couple of times a year – I took the opportunity to visit last weekend as part of the Museum of London’s Festival of Archaeology. These remains were uncovered in 1848 during the construction of the Coal Exchange on the site. Our guide shared a lovely story of the Victorians who discovered it building a spiral staircase (now long gone) down to access the ruins, which strikes me as a particularly lovely piece of Victoriana…The site was to become the first designated protected heritage site in London, forming part of the first Ancient Monuments Act of 1882. In fact, we are lucky to have it at all. As our guide also explained, the Saxons were more than a little fond of ‘recycling’ old Roman materials. 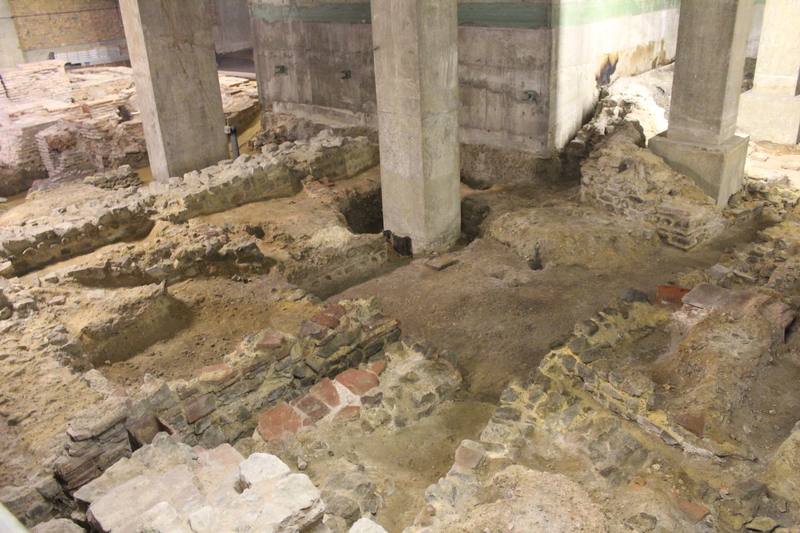 Luckily, those making up the Billingsgate Bathhouse site were saved in part because the area was later covered by a wash of black dirt (some of which can still be seen today on the northern part of the site, pictured above), and also partly by the otherwise destructive force of the Great Fire of 1666, which saw the site further buried under debris pushed down from the hill above. The baths themselves were thought to be attached to hotel or inn – or possibly a private residence, though no mosaics (usually a sign of an elite residence) have been found to date. These buildings would have faced directly on to the Thames itself. While the ruins today – which feature part of the bathhouse and part of the East Wing of the Roman house – are indeed quite crumbly, parts of the flues for underfloor heating of the house (seen above), and segments of the bathhouse, in particular the hot room (seen below), are clearly evident. 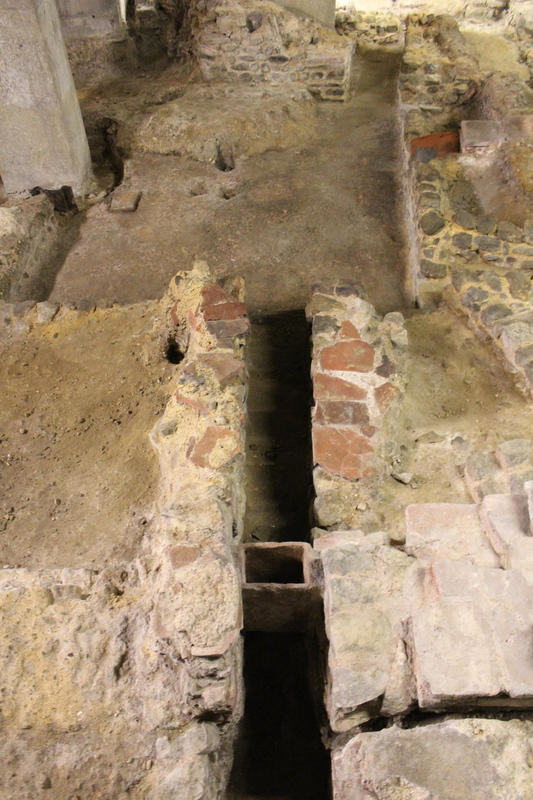 Interestingly, I learnt that a much larger public bathhouse – the Huggin Hill Bath House – still remains preserved, but unaccessible, in a shallow basement on nearby Upper Thames Street. It is possible that future redevelopment of that site might allow for public access. 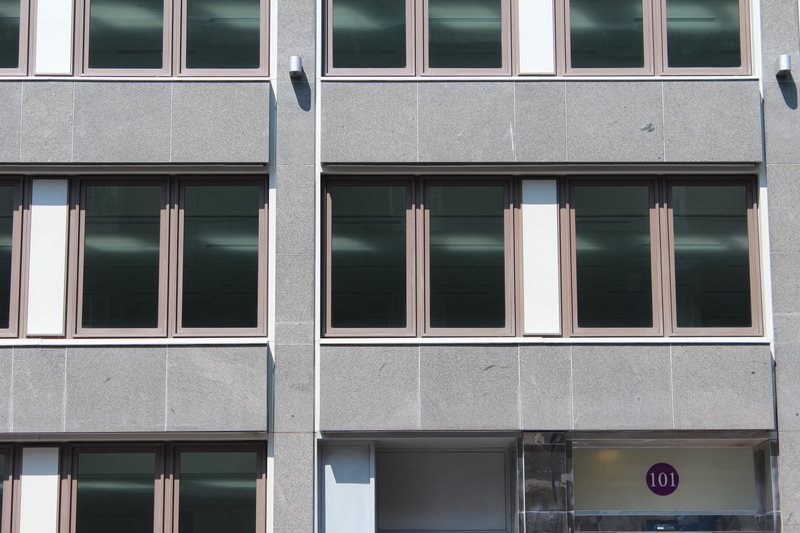 Similarly, it is also possible that the 1967 building directly above the Billingsgate Bathhouse site may be demolished, allowing for a better display of these remains, which are currently punctuated by 1960s concrete columns. 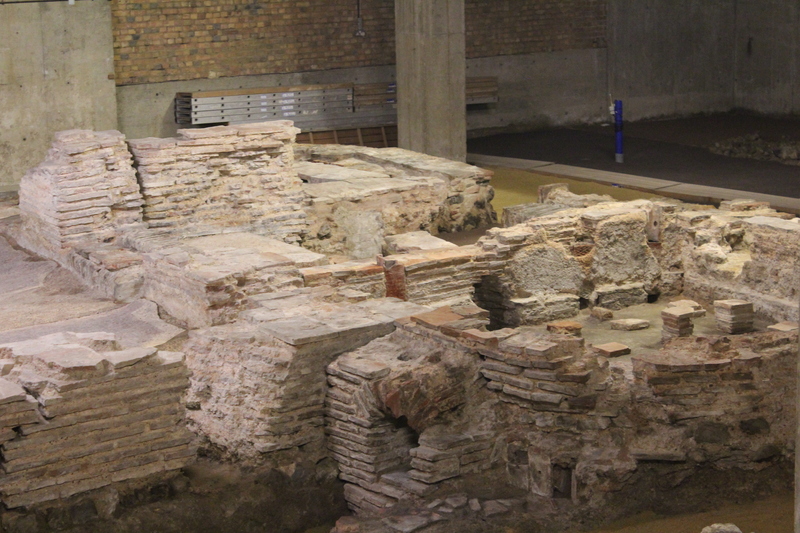 In the meantime, the Billingsgate Roman Bathhouse will be open to the public again for the Open House weekend, on Sunday 22nd September 2013. You may also like to check out David Fletcher’s amazing 3D model of the site – which you can see online here, along with plenty more photos of the site.